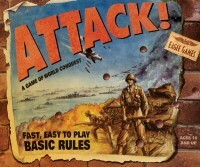 BoardGaming.com> Games> Board Games> Attack! Attack! is a game of expansion and world conquest set in the World War II era. It uses fast, easy-to-learn basic rules. The game immerses the players in the flavor of the period by using over 600 miniatures–infantry, tanks, planes & artillery! Take command and attempt to become the most powerful nation in the world. Attack! Begin the World War II assault! Attack! Is a game in the same type as Axis and Allies. The beauty of Attack! Is that it is so customizable. The negative of it is in the poor production quality. It does sort of have the feel of a cheap game, but if you go in knowing that, you can have a lot of fun with it. You can’t accurately try to portray World War II with this, but that isn’t the point. It is more like Risk with extra rules and unit types. If you like Risk, you will probably find some fun with Attack! The replay value is not great. If you could replay a world spanning World War II strategy game over and over then you could play this one over and over. There are so many different strategies to choose from and the non-preset unit setup doesn’t make it the same first moves every time. You aren’t just going to rush your tanks into Russia as Germany. The components for this game are probably the worst part of it. To represent 5 of a type of unit, the game includes larger versions of the same game piece. These are often hard to distinguish next to a 1 unit. Chips would be a much better way to represent extra troops of each type. The basic game is very easy to learn. With the expansion, the advanced game gets a bit more difficult, but you should always at least try the basic game first with new players before jumping in head first. 2-6 players A 2 player game would be pretty boring, especially with the advanced rules. The advanced rules are interesting because of the 3 political factions, and a two player game would lose that. 10+ age The basic game could be for 10+ age group, but the advanced rules might take someone with a bit more maturity under their sleeve. 60+ minutes A 60 minute game of this would be super short and only possible if someone trounces the other players. It plays out more in the standard times of large strategy games like this. This is a fun game. It is sort of an Axis and allies clone. What I like about it is that the set up is not pre-determined. Also, the naval superiority rules in the basic game make that part of the game go quickly. The advanced rules to use oil for every action you do during your turn is pretty ingenious. The advanced rules political factions are fun to mess with. If you like whole world strategy games, you should give this game a try. Add a Review for "Attack!"